← Grounding, comforting, preparing essential oil synergy. 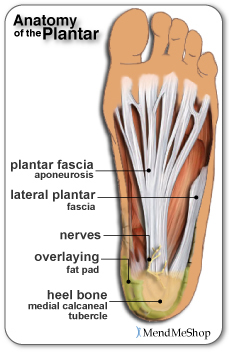 Plantar Fasciitis is a difficult problem to treat, but it is not an impossible one. There are several natural ways of dealing with the plantar fasciits by stretching it and doing deep tissue massage with the essential oils. It is very important to do massage on the sole of the affected foot to break down the adhesion and scar tissue and muscles that are in a way stuck to each other. You should do this massage first thing in the morning or at night. Depending on when your pain is more intense. This is not a long treatment it is about 10 minutes once or twice a day. And the best part you can do it yourself, in addition to getting a professional massage from the massage therapist or physical therapist and i hope they address your calf too. If you do this treatment on ongoing bases you will see wonderful results, although, I must warn you that initially you might have increase in soreness and discomfort as the adhesion and lesions break down, especially during deep tissue cross friction massage (going across the fibers). So here is the self help stretches for you. First you gonna do stretches for the plantar fascia: Get into cross legged position seating at the end of the chair. Cross your legs with the affected leg over the knee. One hand grasps the hill and another grasps the toes and forefoot. Then you slowly and gently pull the toes and the forefoot up and the ankle down. Hold for 10 seconds and release. It is important not to hold it for longer than 10 seconds, you wont be doing any good. Repeat 10 times. This way you will be stretching the plantar fascia and Achilles tendon. You need to stretch both. Once you done the 10 repetitions now you are ready for deep tissue release of the fascia. Start by grasping the forefoot and pulling it back so the fascia stretches, just like above.. but do not pull the ankle down. You will need your second hand for doing the cross fiber friction massage. With your thumb start right at the ball of your foot and push firmly down and glide your hand along the course of the plantar fascia all the way to the hill. You repeat this 3 to 4 times medially to laterally along the foot (covering all three plantar fascia bands that run on the bottom of the foot – medial, central and lateral), make sure that the pressure is really firm. Second step is cross friction massage that you start at the base of the hill. Cross fibers medially to laterally and move owly toward the toes repeating the cross fiber friction across your foot. Now aromatherapy can help relieve inflammation and pain associated with this condition. Use 25 drops per one oz of carrier oil to use only on the bottom of the foot.